Use the Stream Ruby Gem to Build your Social Features in RailsStream for Rails client on Github. Speed up your development. 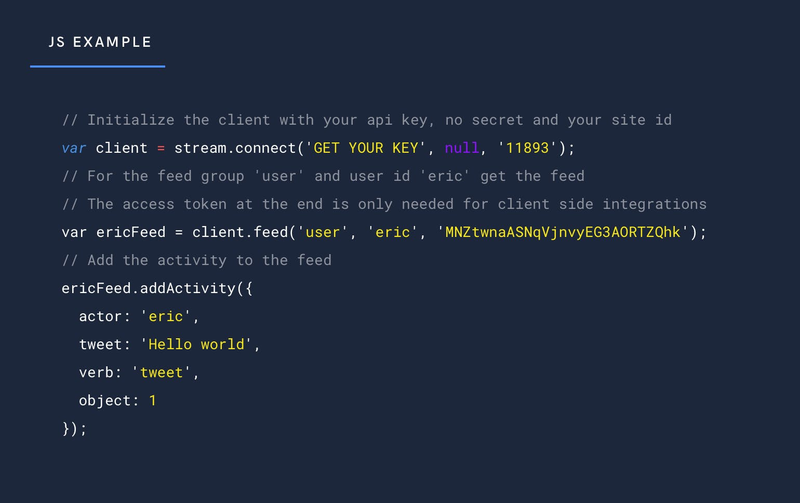 Building a scalable Rails app with powerful social features like feeds, notifications and profiles is made much easier with our Stream API. Stream API and Rails handles the feeds and keeps you fully in control over the end user experience. Aggregated Feeds, Ranked Feeds, feed specific analytics and personalization all help you improve your app's engagement, retention and conversion. You can also use Stream to build personalized feeds into your rails app. Typical social networks usually require flat timeline based feeds, ability to group feed updates along with simple notifications. Stream also offers deep analytics into the engagement of your feed that you can't find anywhere else. With years of building and maintaining large scale feeds; we’ve solved some of the hardest problems when it comes to speed and reliability (especially for Rails). We’ve consistently matched (or beat) benchmarks for updates against the leading Rails social networks online. Your data is backed up in multiple locations around the world, protecting your users and your business. Ruby on Rails is the number one web application framework for the Ruby language. It was created by David Heinemeier Hansson for Basecamp (formerly 37 Signals) in 2005. After release, and in parallel with the success of Basecamp, RoR quickly became a first choice for developers and teams building feature rich web applications. Many of the most popular social sites on the internet are built with Rails. Basecamp (naturally), AirBnB, Github, and Shopify are all great examples. Twitter even started out as an RoR application before being shifted to Scala (hint: we love Scala too). Thanks to it’s full feature-set and vibrant developer community, Rails is definitely a great choice for building Stream powered applications. Continuous integration is via Travis and we publish packages to Ruby Gems. Contributions in the form of issues, feature suggestions and pull requests are most welcome. Our low level Ruby API is also available. mail_outlineContact us if you're using Ruby on Rails and want to be featured.